Here is a link to my BlogTalk Radio Show from Saturday November 23rd where I shared this reading. This week I am guided to use The Mary Queen of Angels Oracle Cards Deck by Doreen Virtue. Mary is a powerful ascended master who can assist all people regardless of religious background or faith. She is a highly evolved energetic being whose vibration can source you information and guidance to create your world the way you desire. Mother Mary is with us this week to show us the way for more grace and ease in our lives. Even in the midst of upcoming holiday stress and energies the keys to being peaceful and happy are given this week. Mother Mary is showing us how to get unstuck and to allow grace and ease to flow in our lives. If there is any area where you are feeling you’re living like it’s the film, ‘Groundhog’s Day’ stuck in a recurring bad dream, the issue very well may be energy stored in unforgiveness. Everyone has suffered and endured some sort of painful situation and perhaps on some level reconciled with it. Yet there still may be unforgiveness in the situation. By forgiving we actually detoxify or purify the situation and are able to move ahead with full energy. We are not saying what happened is forgivable but we are more looking at forgiving the human beings involved. Here we are finally giving up holding on to stored toxic energy that actually tales the place of our ability to be fully present to life and love. If you are ready to let go and forgive that one person, and whoever comes to mind is the one,that is an act to be congratulated. In the end the anger only hurts you and not the other person. We can call upon Mary to assist us in this. “Dear Mother Mary, thank you for putting your healing hands upon my heart and mind, to draw out the darkness of my judgements, blame, and anger toward others. Please help me, Beloved Mother, to see myself and all others as you do and be purified in my perceptions.” Author Wayne W. Dyer spoke of forgiveness in his book, “My Greatest Teacher”. He shared that he had actually gone one day to his father’s grave to piss on it, he was so angry. Instead he found himself standing there in tears and forgiving his dead father. On that day in that moment his whole life turned around. He was present to the fact that his spirit really wanted to forgive . And he did so. His life totally changed forever after that. Here Mary wants us to address balance in our lives. Some of us may be caregivers and or over givers and may feel drained and underappreciated. We are being asked to notice and create for ourselves ‘opportunities to receive’. 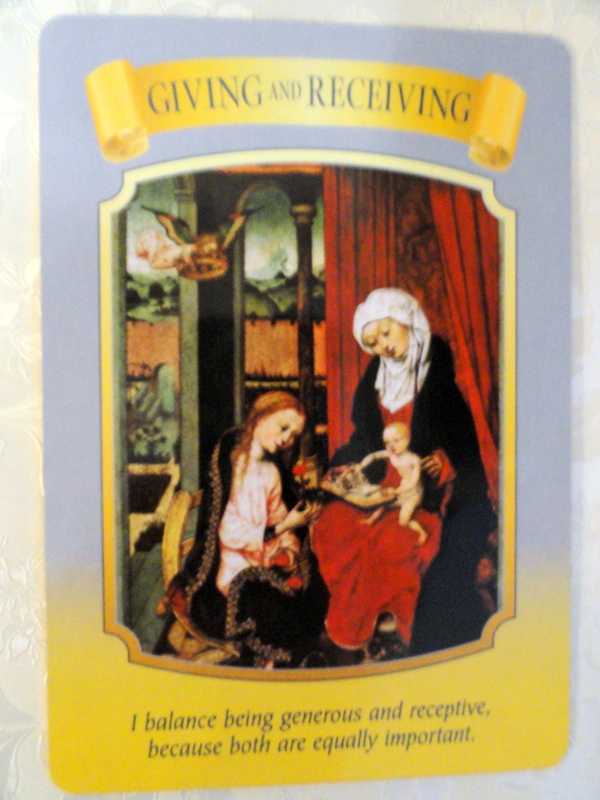 Mary can help us with this habitual pattern of over giving. If you feel stuckness or stagnation in your life, that things are not moving they way you would wish with opportunities and finances, you may be unbalanced in the area of receiving or expecting to receive more than you’re willing to give. We can change this habit by being present to our patterns of giving and receiving. We can even count how many times we give and receive to make sure it is equal. Giving is not always about money though making a donation, smiling at a person or saying hello, volunteering your help, acknowledging someone, making time for someone, and being a good listener are ways to do this. Ways of receiving can be, noticing the beauty around you, sharing your heartfelt gratitude by saying “thank you”, feeling appreciative and gratitude for all blessings, and asking for allowing yourself to receive someone’s help. The message is, do you want more gifts and blessings? Then open the door with gratitude for what you have already! 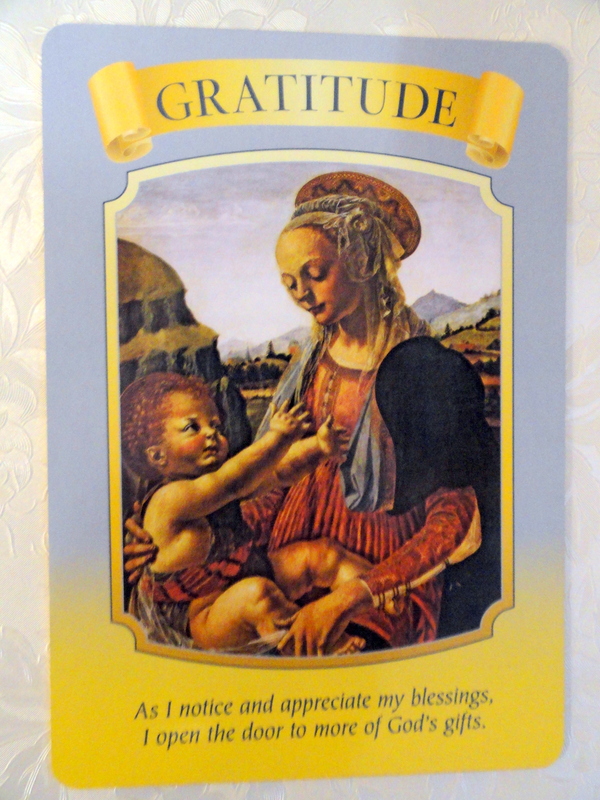 Here Mary is showing us the magical power of gratitude. As your heart warms with gratitude for all you currently have, you open yourself to receive more. Today, practice saying “Thank you” repeatedly aloud and silently. These words are the keys that open the door to happiness, abundance, and fulfillment. By taking time to share and acknowledge what you are grateful for already, you allow more grace to enter your life. By complaining or being negative about your life you actually attract more of the same. No matter what your situation there is always something you can find to be grateful for. Cultivating an attitude of gratitude on a daily basis are indeed the keys to open the door to God’s gifts. 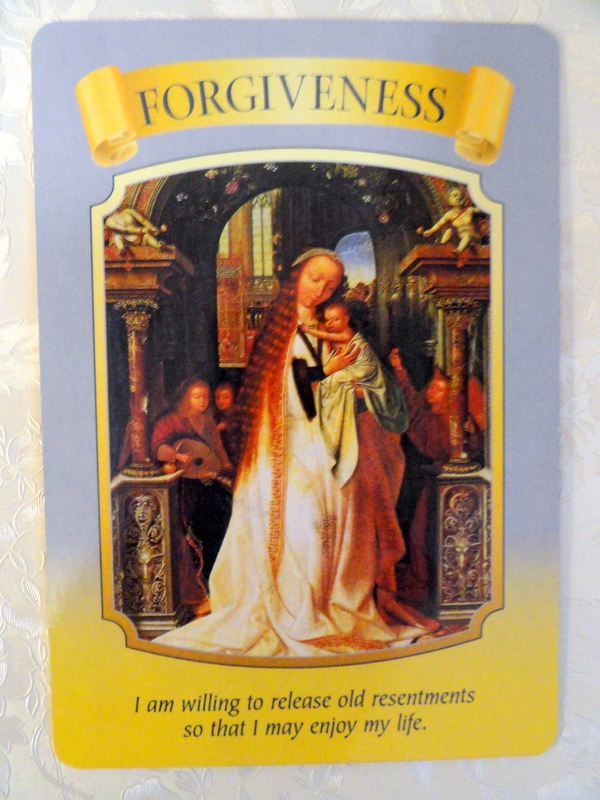 This week Mother Mary guides and reminds us of the power and magic of forgiveness, being responsible for our giving and receiving and of being grateful. These actions will allow for more flow of grace in our lives. Ask Mother Mary to assist you in any moment. She is there at your side to support you with unconditional love. Have a blessed week! Special $10 off Holiday Special prices through December 31st. Purchase a reading as a gift for yourself or friend! See my website for details. Previous Weekly Angel Oracle Card Reading for November 18 through 24.